The option 'Time shift' allows to put a positive or negative time delay. This might be convenient if the laser pulsing does not fall properly within the first time bins. In the 'Output' menu, the output ICS files can be optimized either for ImageJ or for the TRI2 software from the University of Oxford (available here). For ImageJ, it will generate stacks either in xyt or xyz format. In the 'Options' menu, you can select for '2 x 2 binning', which will result in spatial binning and 4-fold reduced output file size. You can also do down-scaling of the time gates with the option '4x time downscaling', which also results in 4-fold smaller files. The option 'Time per frame' generates ICS files for each frame of the timeseries. This option may be required if you want to follow how the lifetime of some process changes over time. Be warned that this option will generate many large files, so only enable if you really need it. In the 'Size' menu you have to manually set the size for PT3 (i.e. 128, 256, 512 or 1024 pixels). This is required for PT3 files (but not for PTU). I did not manage to get size information from the PT3 files, so you have to do this manually. Also note that I could not find the information on the pixel step and you'll have to recalculate the scales afterwards or change it manually in the header. The 'Channel' menu allows to select the recorded channel you want to have analyzed. You can select multiple PT3 or PTU files using the shift and control keys. The output files are written to the same directory as the input files; should be self explanatory. 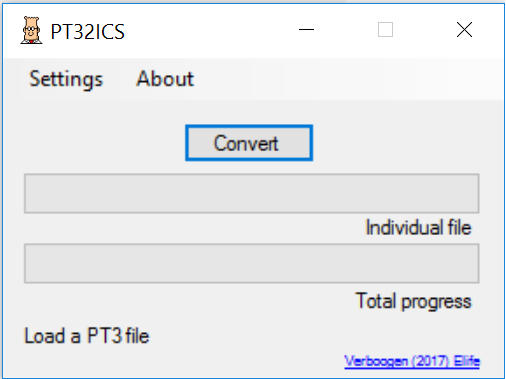 Screenshot of the PT32ICS program. This tool is written in VB.NET and published here using Microsoft’s ClickOnce technology. It will only work on Windows 64 bit. ClickOnce may not have support for Firefox or Chrome, Mozilla and Opera. If you use other browsers than Microsoft Internet Explorer under Windows 64 bit, you’ll most likely get an error. The easiest workaround is to close all other browsers and use Internet Explorer. You can install it here. Please cite Verboogen, et al. (2017) Elife. 6: e23525. 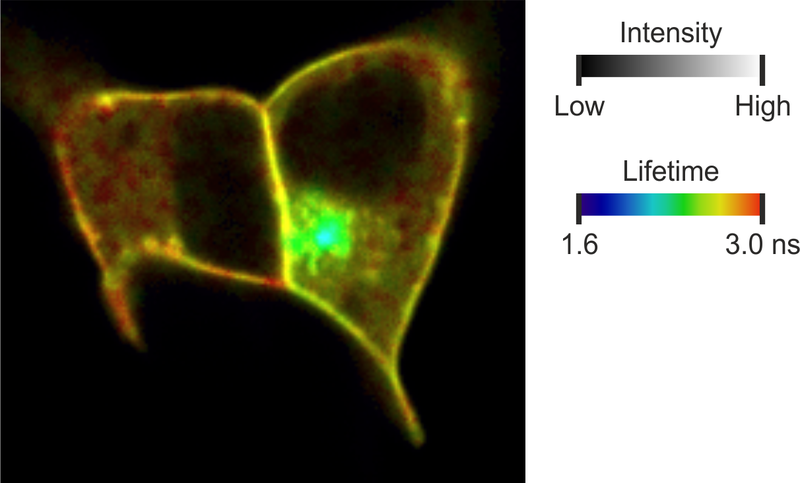 FLIM image of a HEK cell expressing fluorescently labeled SNARE proteins. The photon trace was recorded in PT3 format, converted with the PT32ICS conversion program, and fitted with the TRI2 software from the University of Oxford (available here). The fluorescence lifetime and intensity images were convoluted in FIJI with a custom macro (available here). This is freeware and I will not take any responsibility for any results obtained with it. Let me know your success stories, please report any bugs, and cite our work.